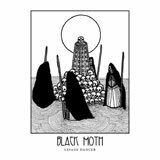 This two-track single marks the return of Leeds retro stoner rockers Black Moth, after what was no doubt a daunting phase of their career, having to follow up a pretty successful and well-received debut, in the shape of The Killing Jar. While they were no doubt chuffed to pieces with how well it went down, particularly in the fuzz rock community, with its judiciously executed, but slightly rougher blend of Kyuss dynamics and strident female vocals, it must have been a double-edged sword having to come up with a follow-up. They have decided to release a two-song single, via the hallowed portals of Too Pure’s Singles Club (the label once home to other righteous female-fronted bands like Th’Faith Healers and Stereolab). I don’t wish to harp on about the fact that Black Moth’s Harriet Hyde is, y’know, female, but it’s brilliant to hear such a resonant female voice in the new-classic rock world, a pretty sausage-dominated musical idiom. Yes there are a few ladies treading the boards out there, but with this release she puts herself right on the map leading from the greats of the past like Grace Slick to current fuzz queens like Laura Pleasants, howling but musical, well-honed, dynamic and out front with a pretty much scene-stealing performance. When she belts ‘Who the hell are you?’ at the end of lead track ‘Savage Dancer’ it makes you want to punch the air, and wear a bandana. It’s awesome. The general feel is Pentagram/Sabbath/Kyuss, but with a palpable sense of fun coming across from all concerned. The guitar tones are very sweet, the solo at the end of ‘Savage Dancer’ is impeccable, but it’s not some sort of tedious hash through tired classic-rockisms. There’s almost a Hole-like rasp to the vocals backed up by the fervent delivery of the band, which keeps everything very lively. And the songwriting is very cleverly done, ‘Savage Dancer’ subtly working its way through the gears, slowing up slightly here and there, and a very natural feel being shown by people clearly comfortable playing together. The vocals are not slapped on top, they have their own melodic hold on things, meaning that this could well filter through the airwaves to a bigger audience, if there’s any justice. ‘Tree of Woe’ is more old-fashioned trudging doom, but keeps a lightness of touch which stops it being turgid. Its Sleep-worship isn’t quite as affecting as the first track’s dynamics, but Harriet’s vocals add a seductive flair, making the song into something much less disposable. They are playing Desertfest on April 26th, don’t miss if you really want a bit of classic doom-flavoured heavy rock, done very well.